The path northward to Stage Coach Road after it leaves the fields behind. It's beautiful here, with a clear trail and a young hardwood forest. Construction on the Kingston and Pembroke Railway began in 1872. Businessmen behind the project wanted to get access to mining and logging operations to the north. By 1876, the line stretched from Kingston to Sharbot Lake. With the opening of other lines, the pressure was off as far as getting to Pembroke was concerned. Still, work on the line continued and in 1884, it stretched to Calaboogie and shortly afterwards to Renfrew, which is as close as it actually got to Pembroke. Total track stretched about 103 miles. Work was also done to extend the line south through Kingston to the shores of Lake Ontario. In 1912, Canadian Pacific took undertook a 999-year lease on the line. However, over the latter part of the 20th century, sections of the line fell into disuse. The last section, between Kingston and Tichborne, closed in 1986. (For more details see the K&P Group's history page.) Bell Canada purchased the right of way on the line in the same year. Between 1986 and 2002 negotiations continued as groups sought to retain the line for recreational use. At one point the local conservation authority was suggested as an owner, but it turned down the request for lack of funds and personnel to maintain the trail. The City of Kingston bought the rail bed and on December 6, 2007 the first section of the trail opened. See my rails to trail page for more information. There were plans afoot to open sections both to the north of the present section, which officially ended at Orser Road north of Kingston, and to the south, deeper into Kingston itself. However, some involved groups (such as the Eastern Ontario Trails Alliance) are chiefly interested in ATV and snowmobile trails, so the northern extension may not be as walker-friendly as the southern section. Finding information on the trail's development on the net is frustratingly hard. However, Here's an overvview of progress up to 2012. Frontenac County (north of Kingston) had a Trails Master Plan made up in 2009 and in 2011 struck a committe to develop the K&P trail. It seems that many online sources are outdated in still ending the K&P trail at Orser Road and that it now extends to the Cataraqui Trail near Harrowsmith. I have not explored that section. A September 6, 2012 article describes the northern extension of the trail best. The acquisition of the trail, as with other trails, has not always been easy. Some landowners were leery of opening the old rail line to the public, particularly for ATVs and to a lesser extent snowmobiles. Happily, the trail promoters so far have kept ATVs and snowmobiles off the trail. However, the motorized "sporting" (what a misnomer!) commmunity are also the folks with the deepest pockets, at least as a cohesive group. Walkers are often pathetic group lobbyists. In some cases (for example the Cataraqui Trail), snowmobilers have been instrumental in saving a rail trail from being swallowed up by landowners. It's a cruel world indeed, full of contradiction. 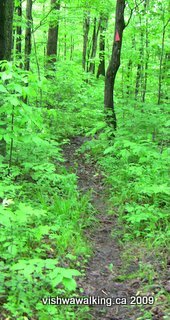 Here's an Eastern Ontario AgriNews article from 2000 outlining some of the woes of creating a trail. Back then, some said it would take "a miracle" to create the the K&P Trail. Well, the miracle happened. The rail bed is an easy walking surface made up of fine gravel solidly laid out. It would make a good biking surface as well. I'll chronicle the K&P to Orser Road, although it is not all part of the Rideau Trail system. The K&P trail is advertised as being 15 kilometres long. I'll clearly note where the Rideau hooks in and out of it. It starts 1.2 kilometres east of Sydenham Road. The road closest to the start is Brass Road, which can be got to by heading east on Arnold Street, which runs off Sydenham about 700 kilometres south of Highway #401, then heading north on Brass. However, a better place to start is Sydenham Road. Then you can continue on east of Sydenham to get a decent walk in. This little section begins just south of Highway #401 at Little Cataraqui Creek. There's a chain link fence here and the abutments to a bridge — but no bridge. The trail starts unceremoniously. You can see the rail bed running eastward on the other side of the creek. Hopefully there are plans to put a bridge in eventually. Meanwhile, to get to the start, you must trek in and then retrace your tracks. Little Cataraqui Creek spreads out quite a bit here, but the trail rides high off it. There are lots of signs of beavers, conveniently trimming trees along the trail and building little dams at the bottom of the trail banks. As you close in to Sydenham Street, back yards and junk appear. Cross Brass Street and a few minutes later you'll reach Sydenham Street. The Rideau Trail hitches a ride on the the K&P for roughly 4.5 kilometres, starting at Sydenham Road and cutting right about 600 metres to the north of Bur Creek Road. Anyone (like me) with an old Rideau Trail Guidebook take note: the Rideau used to take another route at the south end of this section, largely along roads. The K&P is a superior route. Sounds from Highway #401 affect most of the southern part of the K&P. It's constant, even beyond Bur Brook Road. The trail passes marshland on the left with Highway #401 on the right. The trail curves through some cedars and heads northward under the highway about 2 kilometres from Sydenham Road, then runs through scrubby cedar before reaching McIvor Road. North of McIvor, there's more to see. A transport truck junkyard appears on the left, followed by a little lake. It was fairly populated with Canada Geese and ducks on the afternoon and evening I passed by. This is part of Collins Creek, which is the wetland surrounding you and which stretches up to Collins Lake to the east. As the marshland gives way, there are fields and buildings on the left and rough fields on the right. Watch out for the bashed-out Volkswagen van on the right, just past a funky old bridge. Land along this section is burdened by copious roughly-made "no trespassing" signs. As Bur Creek Road approaches, a little creek with well-built banks tumbles northward under the trail and through a culvert. The trail comes out at Jackson Mills Road. head north down the hill and past a few houses to cross Bur Brook Road hook up with the trail again. Rating: to McIvor. After McIvor: Easy. There's no official parking at Jackson Mills and Bur Brook roads, so it's not the best of starting points. If you're choosing between the Rideau cut-off and the main K&P trail, note that the latter is 1.5 kilometre longer, but the Rideau cut-off section is considerably more rigorous. Off to your left there's some kind of farming/trucking operation going on, and the trail rides high here. Note what seems like a wrecking yard for houses to your left. My map shows an abandoned rail line running parallel for some time to the right of the trail; perhaps that's the farm track running through the field. Just before the 600-metre point, there's a little stream with a mini-waterfall pouring off the rocks. (This may not run later in the season.) Note that the rocks are changing already here, particularly a big outcrop in the middle of the field to your left. We're already getting hints of the Canadian Shield. The K&P now curves left and gently ascends the side of the ridge. There are some nice man-made rock-cuts here and some little creeks (in the spring anyway) crossing the trail. You can see the valley below spreading out through the trees as you arc away from Bur Brook Road (also called Bur Creek Road on some maps), then cut back into it to meet it again where it intersects with Cordukes Road (about 2 kilometres from the first crossing of Bur Brook Road). The trail crosses Cordukes and runs along the little parking lot parallel to Bur Brook Road and along westward, curving up shortly to head north. The curve is a fine one, cut into the rock. Enjoy it; it's pretty straight hereon in. From here to Unity Road, you have some 2 kilometres of straight road. It's mostly farmland on either side, with patches of woods. Very roughly one kilometre from the curve, there is a patch of woods on the left. There are several little trails hidden in the trees here. They provide a bit of relief from the straight trail. I'll let you discover them if you need a break. You can easily get back to the track when the woods peter out. There is a good parking lot at Unity that gets your car well off the road. From Unity Road, the trail continues, gently rising, but still very flat. About half a kilometre north, an old collapsed house and outbuildings can be seen on the left. There are four or five wrecked cars lying about, as well as some interesting old machinery. In the house is an old bath. A second foundation looks as though someone attempted to make a home here within the last 40 years. By the way, I recommend staying on the trail for more than just the need to protect farmers' fences and other property. At one point, sitting quite close to the trail (on the other side of the fence) was a huge bull, with his harem clustered around him — not something you want to encounter without a fence to keep the divide. From the cutoff to the right of the K&P Trail, the Rideau heads steeply upwards. It winds about and near the top roughly follows an old cedar fence line through scrubby cedar mixed with scotch and spruce and other mostly softwood trees. This is a fine section of the trail. A sign indicates it is private land and I stayed dutifully on the trail. It was very slightly wet when I travelled it, but I ran into no serious snags. At just over a kilometre, the trail opens into a field with hydro lines running east-west and some kind of industrial operation to the north. The trail follows the hydro lines, staying slightly to the south before cutting across them and heading for Unity Road, where a style gets you over the fence and onto the road. The Unity Road section, just under a kilometre, is boring and straight. Rating (from K&P cut-off): Moderate. Unity Road: Easy. The trail now turns north from Unity Road. The track is indistinct through the first field; it seems that walkers have chosen one of several possible trails and none have become worn. However, after the first style is crossed, things become clearer and the farmer's track, after passing through an open gate becomes very clear. Just before a pond, there is another gate that is unlocked, but which walkers need to close behind them. Just before the open gate, the grassy road joins a gravel road. This continues past the aforementioned pond on the right in a straight but not unpleasant fashion through scrubby half-fields until a road comes in from the right and the trail returns to a dirt and grass farmer's track. Near the entrance to the wood, a cabin with a well-stocked pile of firewood appears on the left. At several spots along the trail, there are other stacks of firewood. Not long after the camp, the trail turns left and follows a cedar trail fence. Beyond the fence, you can see a marsh. As the fence peters out, the trail veers slightly south and away from the marsh. There are several trails here, but the red Rideau Trail markers will keep you on track until you come to a style. Once over the style, take care. There is no apparent marker. If you walk to the far end of the clearing on the other side of the style, you'll find plenty of trails and a picnic table hiding behind some trees; it's a good place to take a breather. My 2001 Rideau Trail guidebook lists this as a camping spot for through hikers. There's no water (except the marsh), but would make a decent spot if your water supply is adequate. However, don't follow the trails here; go back to the style and veer to the right, where you'll see a path leading down the hill. Watch very carefully along this next section. Markers are not all that clear. I found it useful to look behind me constantly to see the return markers. Basically, you're heading for the edge of the marsh. Once you reach it, stick with it. At one point the trail curves away and up to a field. Keep a close look at the angle of the markers and stick to the marsh until you get close to the trail. The K& P Trail is apparent whenever you get a good look over the marsh. You can see the trees lining the trail as it cuts across the marsh in a straight line. At the K&P Trail, you can follow the markers very briefly southward until they send you to the right and up the trail, or just hike directly up to the trail and head north. The K& P trail is 3.3 kilometres from Unity Road. We now hitch a ride on the K&P Trail, described in the red box below. After the Rideau trail joins the K&P, the trail continues its curve but eventually straightens out. When it does we lose the tree cover and only get it back for a brief stretch once more before Unity Road. Marsh and fields dominate. There is one section in which a little stream flows under the trail. On the left (west) side, there are a few young trees and the farmer's field is in the background. As the straightness of the trail can get monotonous, it would be a fine thing if the municipalities or trail keepers could purchase a few acres here and make a mini-park that could serve as a picnic spot. But — it's easy to dream and much more difficult to negotiate such things. At Unity Road, there's a gate, but not a lot of parking space. The K&P has done a great job of providing parking space at strategic places in the south. Overall, the K&P trail is a fine trail, with lots of variety. Like any rail-to-trail, it suffers from unduly straight sections, but the K&P folks have laid down a great fine-gravel bed that works for walkers and bikers. Orser Road was the official end of the K&P Trail. it's now been extended to Harrowsmith and hopes are that it will eventually stretch to Sharbot Lake at some point. The Rideau Trail continues below. From the K&P trail, the Rideau turns eastward down Orser Road past a little cluster of houses for less than 300 metres before turning northward once more. Be aware that some changes have been made in routes since the early 2000s. Only a few years ago, the Rideau began its piggyback on the upper part of the K&P; before that it headed north farther east, and not long before that, it had yet another route farther west. It might be interesting to try to pick the old ones out and compare and contrast. At any rate, take older guide books with a grain of salt in this section. This section offers a wide variety of walking conditions: marsh, road, forest and field. From Orser Road north the trail is straight. When I walked this section in May, it was fairly wet, but there were no impossible points. (I also walked it after a heavy rain.) The path is not well trodden, so the long grass soon had my inadequate clothing soaked. After the hydro lines, a double track lane improved walking. At Forest and Murvale Roads walk north a short distance until you see the red triangle pointing you into the field to your left. Follow the map closely here, because there are neither signs nor clear tracks to help you. Follow the road north (inside the hedgerow) through a couple of fields, until signs point you toward a falling-apart barn. A falling-apart barn is a good marker to help you orient yourself in this section. Walk over the driveway (with the house to your right) past the barn and into the scrub woods. The signs are good here and the path is clear enough but again not well trodden. Watch for large patches of poison ivy. They are impossible to walk around if you stick to the trail and avoiding them involves a bit of bushwhacking. When you return to the field, the trail heads toward the road, follows it briefly, then angles east again. At the east-west hedgerow between fields, turn right (east) and follow the hedgerow as it curves around northward, avoiding a house to the right just before Railton Road. Cross Railton Road and follow the signs into the field, again following the hedgerow eastward, then north. Shortly after turning north, it gets a bit marshy here. The grasss was long in May with an indistinct path, so you need to watch closely for signs. Stay close to the edge of the field until the trail enters the brush woods. The signs are not clear here, but don't be tempted to strike north across the open field. The trail winds through scrubby forest with the field on your left until it breaks briefly into the field again, where you will turn right. You will only briefly be in the field before it turns (very slightly) south to get you into the scrub woods again and moving eastward. The trees are more mature here and this is a nice winding walk. Signs are clear. After climbing over one trademark Rideau Trail style the trail leaves the fields behind. You will briefly meet some double tracks here, but leave them to continue eastward. Basically, you are walking east just south of the top end of the big field you entered at Railton Road, which has a little dog-leg in its north-east corner..
As the big field ends, the trail winds north between the big field's eastern edge and another big field farther to the east. This section, almost to Stage Coach (or Stagecoach, both spellings are used on different maps) was the highlight of this walk for me. The single path is clear, the trail markers are clear, and the young hardwood forest, with some interesting older trees is fantastic. After passing between the fields, the trail heads east on the northern side of the field until it hits a rutted track and heads north. There are signs of horse riders here. The trail (clearly marked) then stays right of the larger path/road past a house, then follows along the right side of a cedar-rail fence. Eventually you will reach a little stream and a marshy area. The trail comes out into a field briefly, following it very briefly southeast. Watch very closely here and don't misss the sign pointing back into the shrub wood. If you miss the signs, you will simply follow the edge of the field where you'll eventually meet the road. However, the slightly marshy scrubwood is more interesting and once out of the field the signs are good. The wood narrows as you near the road. You'll see a shack to your right at the edge of the field before connecting briefly with a little double track that meets Stage Coach Road at the Lambert Road intersection. A rather mundane one-and-a half kilometres straight north on Stage Coach Road gets you to the intersection of Rutledge Road (County Road #5). The local high school is across the road off to your right and an Anglican church is straight ahead on the right. How to get there: The K& P Trail connection starts just south of Highway #401 at the Sydenham Road cutoff. there is a parking lot on the west side of the road. The trail can be accessed through a number of roads between here and Sydenham. The K&P trail has very good parking lots. McIvor Road is good. Bur Brook Road is not a good spot to park. The intersection of Cordukes and Bur Brook roads has a good parking spot, as does Unity Road. Van Orser Road has a tiny spot you can squeeze into. For the Rideau, there are wide shoulders on Unity Rd, where you can park, but no official spot. Same for Van Orser, which is a smaller road, but there's plenty of shoulder as long as there are only a few cars. Same goes for Stage Coach Road at Lambert Road. After that, it's Sydenham, with plenty of parking. If you drive north on Sydenham Road at Kingston and Highway #401 (at the K&P Trail connection), it's roughly 18.5 kilometres to Sydenham. Sydenham Road ends in a "T" intersection at Rutledge; turn left (west) for just short of two kilometres, where you'll meet the Rutledge Road intersection and Mills Road which will take you north into town.